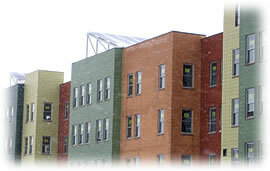 Lakefront Supportive Housing is committed to ending homelessness as a matter of social justice. As a not-for-profit, Lakefront advocates for and provides quality supportive permanent housing for adults and families who are homeless or at risk of becoming homeless. The 68,535 square foot, four story affordable housing design includes a total of 51 apartments (27 family units and 24 SRO units) and a 4,000 square foot storage basement. Lakefront has incorporated the highest degree of sustainable, green design possible for this new facility. This has been accomplished, but not limited to, the following ways: (1) specification of “green” products, using recycled materials, or those inherently environmentally friendly and sourced locally whenever possible; (2) utilizing energy efficient heating and cooling through the use of high efficiency boilers and a heat recovery system, super insulation at exterior walls and shading devices on south and west exposure; and (3) incorporating green power generation utilizing roof-mounted photovoltaics. Millennium Park - Monroe St.
Millennium Park - Randolph St.